You can transfer your registration code to a different PC by using the same registration details as your old PC. Simply Click on Help -> Register from the pull down menu, and then enter your Register Name and Registration Code details and then click "Register" button. The program will prompt you if you want to make the transfer of your registration code to this PC, click Yes to confirm the transfer. Make sure the registration code you entered is EXACTLY as provided in the "Order Confirmation" email. The key is case sensitive and contains no space. 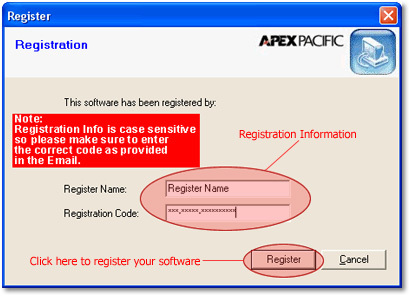 Use "Copy" and "Paste" function to enter your registration key easily.